We were inspired to create the Black Crystal because of an interest in creating an aesthetically-pleasing ‘life hack.’ Since our team consists of three members who are both Wharton and Engineering students, we often do not have the time to regularly check the stock market. 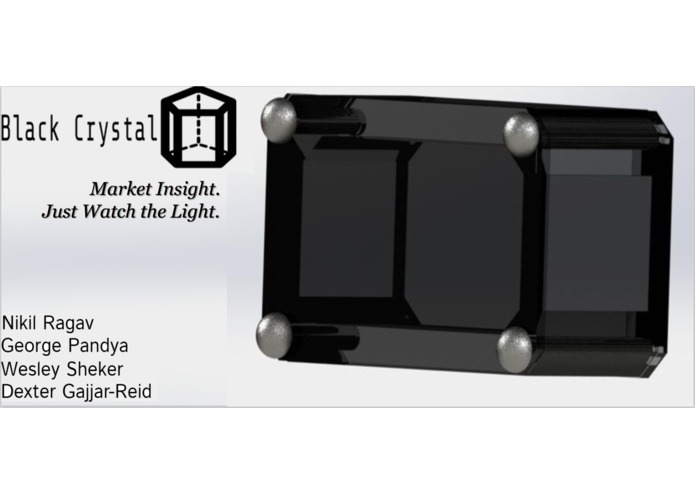 A relaxing desk accessory, such as the Black Crystal and its light display, would be even more functional for casual investors who could be seamlessly alerted to a changing market throughout the day. 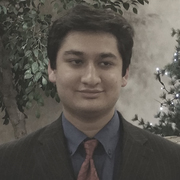 We also wanted to interact with the Blackrock Aladdin API, and this project offered an opportunity to integrate the Blackrock API and use the data collected on multiple different platforms. This lamp interfaces with the stock market and automatically adjusts the lighting color based on market trends. The user can also remotely control which stocks/indices are monitored from a web portal. The piece itself was created from laser-cut dark-grey acrylic, bolted together, creating a very elegant and sturdy appearance. The electronics consisted of tri-color LEDs connected to an Arduino for data input. The software was designed to be simple, customizable, and swift. To this end, the Aladdin API was used to access the market data. The market data is accessed by a web server, which streams this information to the Arduino inside the Black Crystal. The Arduino analyzes the data and determines which color to light up. On the front end, users are presented with an online interface that allows them to remotely customize which stocks/indices to track. The website was made using Node.JS on the backend and Jade on the frontend. It is very difficult to wirelessly communicate with an Arduino. Even with a WiFi board, Arduino's WiFI libraries were buggy, with an inability to acquire SSL certificate, connect to WPA 2 Enterprise networks, and an inability to install up to date firmware. The latter was an especially difficult hurdle because this prevented the Arduino from communicating with directly with the Aladdin API, as originally planned. This forced us to design a backend on the website, which was originally planned to only serve as an interface for the user. The fact that we had to design a backend significantly set us back on our schedule. 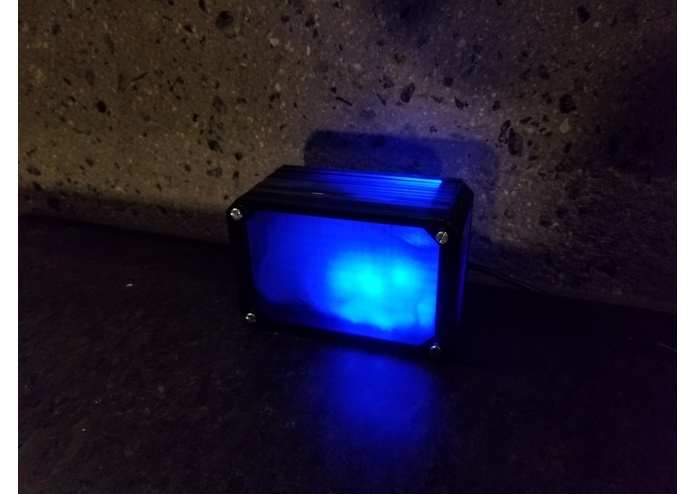 Additionally, the laser engravers used a buggy controller software that created parts that did not match the specified dimensions. Our biggest accomplishment was creating the software that allowed an Arduino to wirelessly interface with a web backend, user portal, and the Aladdin API. This took the majority of our time, presenting us with numerous hurdles along the way. We are very proud that we solved these hurdles. In solving these problems, not only did we improve our engineering process, but we also learned more about web development and wireless communication. For everybody on the team, the laser engraving software was brand new, giving us an opportunity to learn how to use DraftSight. The more important future application of Black Crystal and its technology is its application to real-time financial data collection and integration of that data with an ‘internet of things.’ Negative market activity can have a serious adverse effect on an economy, even if there are no real economic effects immediately (one prominent example is the pound’s collapse after Brexit). By integrating various systems with financial data, it may be possible to apply behavioral science to mitigate the harmful impact of certain responses to market changes. If Black Crystal can reach a mass-market, more people may be inclined to trade in the stock market, as they see the market fluctuations on the daily basis. This would great boost the economy, but for this to happen, we will need to create a plan to mass-manufacture Black Crystal, as well as create a frontend and backend that can handle a heavy user load, while securely transferring data. Finally, Black Crystal can be designed to display data from multiple markets at the same time. Now that we have proven the concept with a well-designed prototype, we can grow Black Crystal further.